For the longest time (okay, for about five years) I would attend conferences, learn lots of great new ideas, and take them back to my school. I loved hearing from other educators about the awesome things that they were doing, but I didn’t really see what I had to share. Then I discovered the Maker Movement, did my first conference presentations at FAME 2014, and haven’t looked back since. I’ve gradually learned to get more comfortable with sharing the awesome as I’ve begun to recognize that I have a voice worth sharing, and that others can benefit from hearing about my experiences. I’ve shared my advice on surviving and thriving at conferences before, but now I want to take that a step further. We all have amazing stories to share and voices that need to be heard. 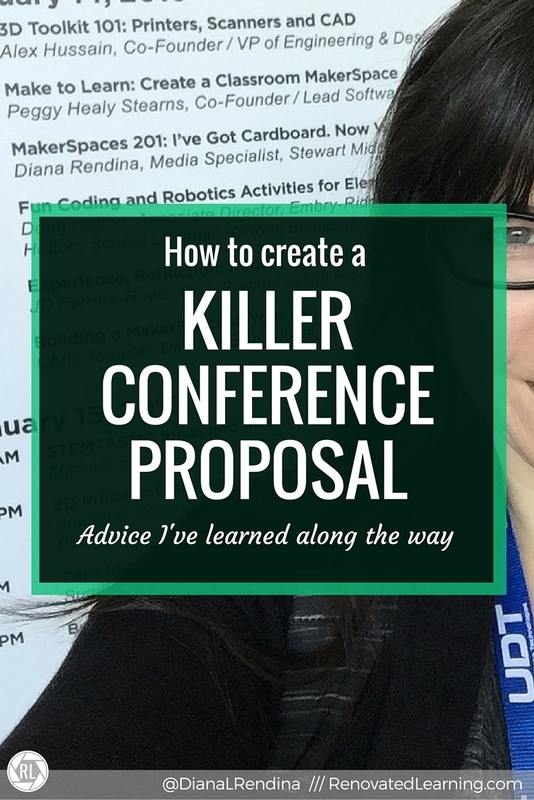 But taking that first step of putting together a conference proposal can often be daunting. I’ve put together MANY proposals over the past few years, and I’ve also served on conference proposal review committees, so I’ve seen a lot of what to do and what NOT to do. Hopefully this post will help you to feel more comfortable taking the dive and writing your first proposal. And even if you’re a seasoned conference veteran, maybe there’ll still be a thing or two you can learn from here. The title says so much about a presentation. You want something that sounds catchy and interesting, but also timeless. Avoid really current pop culture references, as they often start to sound dated by the time the conference comes around. Plus, you run the risk of other sessions having similar titles (I counted a good five sessions at FETC 16 referencing All About That Bass). DO make sure that your title describes what your session is actually about – if it’s super-catchy but vague it won’t be effective. The problems with this description – we have no idea what tools they’re actually going to teach about. There’s a lot of buzzwords, but not a lot of substance. If you’re focusing on specific tools, name them. Give examples of how the learning can be applied. Make sure that your attendees will know what they’re getting into. If your session topic and description are too broad, you’re likely to end up overlapping the content that someone else is covering. We only need so many sessions on intro to makerspaces, “60 tools in 60 minutes” etc. Try to find a specific focus that makes your session unique. Maybe you came up with mobile maker carts that visit your teachers’ classrooms? Maybe you took your students on an AR field trip? In general, I’ve found that presentations that focus on something specific are better than ones that are really broad. The exception to this is if the concept you’re talking about is really new and if the majority of your audience has little familiarity with it. For many conferences, part of the proposal process is choosing what type of session your want to or are willing to present (poster, concurrent, workshop, keynote, etc). Make sure that the content of your session proposal fits with the session type. This also applies to picking a category/subject for your session and who the relevant audience members are. If the options that you choose don’t really make sense for your content, it makes your proposal less likely to get picked. Use all the characters available in the application. Describe your session with as much detail as you can fit. I’ve seen session proposals before with only one or two sentences describing the session when there were still paragraphs worth of space left. Don’t forget to spell check and proofread for grammar. Nothing turns me off more as a proposal reader than an application that was obviously thrown together haphazardly. Be aware of the due date and leave yourself plenty of time for your proposal. Even if you’ve used the same proposal before, different conferences have different requirements. Some conferences like ISTE require you to list specific standards that your session relates to. Allow yourself enough time to research things like this and develop a good rationale. If you wait until the very last minute to get your proposal together, it will be obvious to those reading it. You might still get in, but wouldn’t you rather get in with a stellar proposal than by the skin of your teeth? Have you applied to present at conferences before? What are some of your best practices?